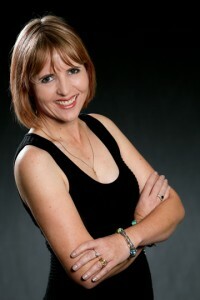 I am so excited today t o introduce you to my friend Nicole Flockton ! She is celebrating her first book birthday! Her yummy debut romance Masquerade is out tomorrow *singing* Happy book birthday to you, happy book birthday to you! Happy book birthday dear Nicole… Haaaappppy book birthdayy tooooooooooo you! And many more! Please join me in welcoming Nicole to my virtual interview couch and have some virtual cupcakes or mini chocolate chip muffins, cause she is a fan of those too. Really, who isn’t? They’re so tiny and cute! Me: Hello my darling Nicole, welcome to my kingdom of Tartlandia. We have a ceremony that we need to do before we can relax on my virtual couch. Stand still… *pulls out my royal scepter* I proclaim you Auss ie of Tarts… you may kiss the bride, Wait! Wrong finale <g> Tweet tartly but sweetly, read much and spread stories far and wide. Yay! Take a seat on my interview couch and get comfy. Can I get you anything to drink? Coffee, tea, water, soda, strawberry daiquiri? *waves scepter* Your wish is my command. *giggles* This scepter thing is a bit of a power rush. :p It does make me feel all queenly. Do you feel different now that you are an honorary member of Tartlandia? We met a few months ago on Twitter and I’m very glad we did. 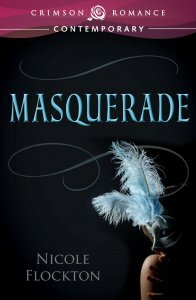 I love meeting people who share my passion for fiction and am delighted to help spread the word that your first novel, Masquerade, is here! *squee! * How long have you been on the journey to becoming a published author? Nicole: I played around with writing for a couple of years after I had my daughter, then I had my son and once I joined a critique group in 2006 I had to become serious because I’d committed to a group and well I could’t keep going without presenting them with work! I submitted my first partial Manuscript in 2008. So four years from first submission to receiving a contract. Nicole: Wow, thank you for those words, it’s what every author wants to hear, that our words have penetrated our readers souls. Masquerade started as an initial idea of someone gate-crashing an exclusive New Year’s Eve ball. Then it blossomed into the story it is now. With regards to the medical scenes, thank you for saying they felt real. I watched an Australian show called “All Saints” which was based in a hospital and also Grey’s Anatomy, so they were in my mind’s eye when I wrote this book. I’m extremely fortunate that the mother of one of the girls in my critique group is a nurse. I always got my critique back from Kym with notes from her mum about how things would be done. I also looked up some things on the INTERNET too. But I never self-diagnose LOL! What are you working on now? Do you have stories planned for any of the secondary characters in Masquerade? I am very curious about Sophie’s best friend Phoebe and also Dawn, one of the night nurses and the hospital. But really, I’m curious about whatever story you choose to tell. I loved the characters and heart in your first novel and definitely want more. Nicole: Funny you should mention those two characters! I’m currently working on proposals for those two ladies. When I first wrote Dawn I imagined her as a much older woman, but as I was going through my edits, I approached my editor saying I wanted to change her character a bit, make her younger and add a little more to her. My editor liked that idea a lot so I did. Me: Yay! I do want to know what’s in store for both of them! Me: I’m curious- I know you are Australian *sigh* It’s that yummy accent! lol But are you living Down Under now or are you a transplant? Nicole: Yep I’m Aussie through and through! I currently live in Houston Tx. Have been in Houston since 2009. I’m initially from Perth, Western Australia. What’s the style of a favorite pair of your shoes and how do they help or hinder your writing process? Nicole: Well I was in California in July for Nationals and after a fund few days at Disneyland we headed for LA. Of course when in LA you visit Beverly Hills. My wonderful husband bought me a gorgeous pair of Jimmy Choo sandals. So they are my writing reward shoes. So I look at them and write more so I can sell more stories and by more Choos! The Royal House of Tartlandia feasted their eyes on the freshly baked Kaloolon as it sat cooling on the table. Please write me a little story or song or poem or something-something starting with…. Chocolate or vanilla? : Oh chocolate of course! Nicole: Thank you so much for having me here at The Book Tart! I’ve loved every minute of it. You can get more entries my liking us on Facebook, following us on twitter etc. Hi Rissatoo – wouldn’t that superpower be great! Sadly I’ve yet to figure out how to get this superpower! Thanks for stopping by! What a fun interview! And cupcakes, yum!!! I noticed there were 3, so I helped myself to the last one! Seems I’m always close to a deadline of late, but I can’t wait to read Nicole’s book as soon as I have some free time. I like to go from start to finish without interruption when possible. Soooooo happy for you Nicole! Enjoy every minute of your release mayhem! Oh 🙁 on deadlines but it means I get to read a new Wendy book!! Thanks for stopping by. This was such a fun interview! My favourite dessert is rainbow chip cake with whipped cream icing. Or cookie cake. Or peaches and cream cheesecake with quadruple thick graham cracker crust…. Wow some cool sounding desserts there! I think I might have to go find myself a mini-choc cupcake now! Thanks for stopping by Evelyn! I’m Here! I’m here!! Sorry I’m late – can’t believe I’m late for my own party! Thanks for the wonderful review and interview Kat! I’m honoured to be here! Hello, you tarty lovelies, what a great interview! You don’t need to enter me in the competition as I have pre-ordered my lovely cousin’s book and am waiting impatiently for it to pop up on my Kindle. But because I can’t resist a discussion about dessert, I will say that my current favourite is chocolate pie (which I just posted a recipe for on my blog, co-incidentally). It’s rich and creamy and chocolatey and dieting kryptonite. I admit, shame-facedly, to not having discovered the Book Tart before, but I’ll be following you now! Aww thanks Cuz for visiting! I’m waiting for your book to be available over here!! Let me know when it does! I love books with hospital settings so I’ll definitely be looking out for this one. As for desserts – Trader Joe’s sells these amazingly yummy little ice cream bon-bins – vanilla ice cream on a soft chocolate cookie crust covered in dark chocolate. One is only 80 cals. or so, so you can eat it without feeling guilty. What a great interview! You ladies had a ton of fun! Nicki, I am a HUGE sucker when it comes to chocolate muffins too! Well, if I’m being completely honest, anything chocolate. Congrats on your release day! Desserts..yum! My favorite is a slice of chocolate cake with lots of icing.